With all of the back-to-school sales and supplies popping up in all of the stores, it made me think about all of the fun fall and Halloween patterns we have in the HBD shop! Love fall leaves? Our Seasonal collections have you set! The Seasonal Placemats set #3 and Seasonal Table Runners set #3 each have a fall leaves pattern. 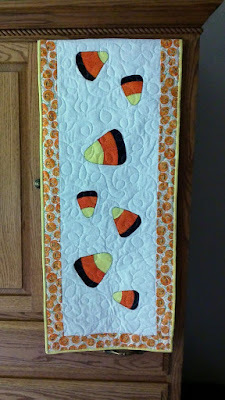 Seasonal Placemats set #2 and Seasonal Table Runners set #2 have a Halloween candy corn pattern! 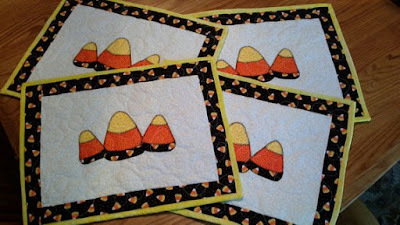 We also have the Candy Corn Placemat KIT that includes the pattern for Seasonal Placemats set #2. More into ghosts and ghouls? 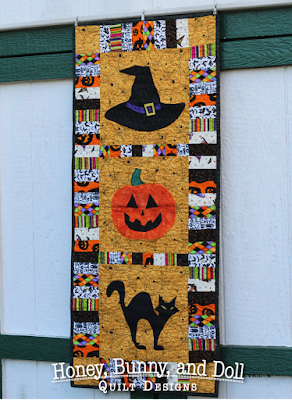 Check out our Halloween Spooks pattern -- perfect for a table runner or a wall hanging and includes SIX different Halloween applique motifs for you to pick and choose your favorite designs. And if all of this applique isn't your thing, we also have our Log Cabin Pumpkins table runner! 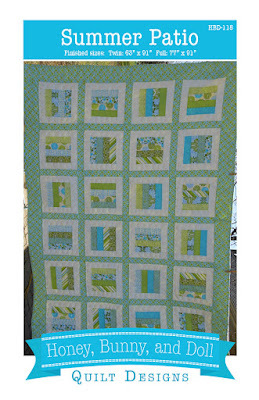 Don't forget to join our HBD Quilts Facebook group for tips, tricks, sale previews, and more! Despite it being one of my top WIP priorities for the last few months, it took until last weekend for me to settle on the final free motion quilting motifs and get excited about finishing the quilting on my Traveling Quilt Bee (TQB) quilt. When I last posted, I had three sections to go -- two block sections and the border. 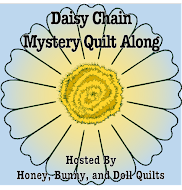 I had planned to quilt the two block sections with a wood grain motif in one and an echoed daisy-ish motif in the other, and to quilt the border with wishbones. I changed my mind on all three sections! For the first block section, I did an echoing motif that sort of looks like a sunshine but to me also looks like a fried egg. For the final block section, I decided that I wanted to do a sharp stipple (also known as a zipple by some!) instead of another curvy and round design. This is a design that I really enjoy quilting -- I like being able to intertwine the different passes of quilting with the points and echoing. For the borders, I used a flower meander. 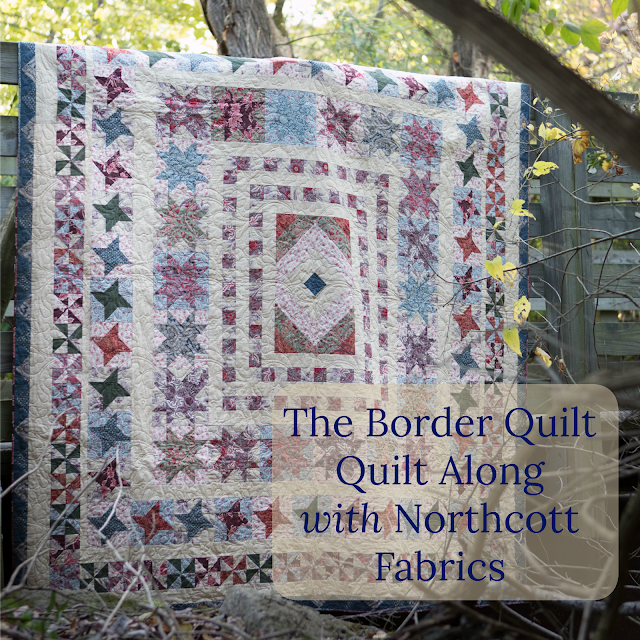 I was originally thinking that I might quilt the border with black thread, but I am glad that I decided against it! I think the white flowers popping off the black fabric is fun. This quilt is now trimmed and ready to be bound! I initially thought I was going to have to buy something new for the binding, but look what I found in my stash! I was even able to find out where I got this fabric: I got it while on vacation in 2012! The binding says that it's from In The Beginning fabrics in 2006! The lighter print looks great next to the border, and especially next to the black solid fabric. 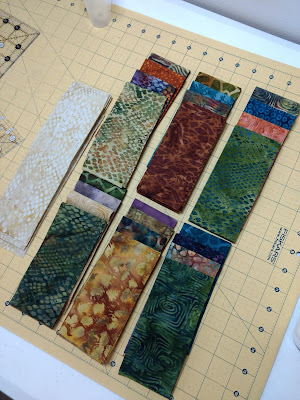 I cut my binding strips at 2.25" which enabled me to squeak in 8 strips out of my half yard of fabric. My plan is to sew this to the front and stitch the binding to the backside over the next few days while we have company in town. Hopefully this will be finished by the end of the month so that I can finally cross this off my WIP list! 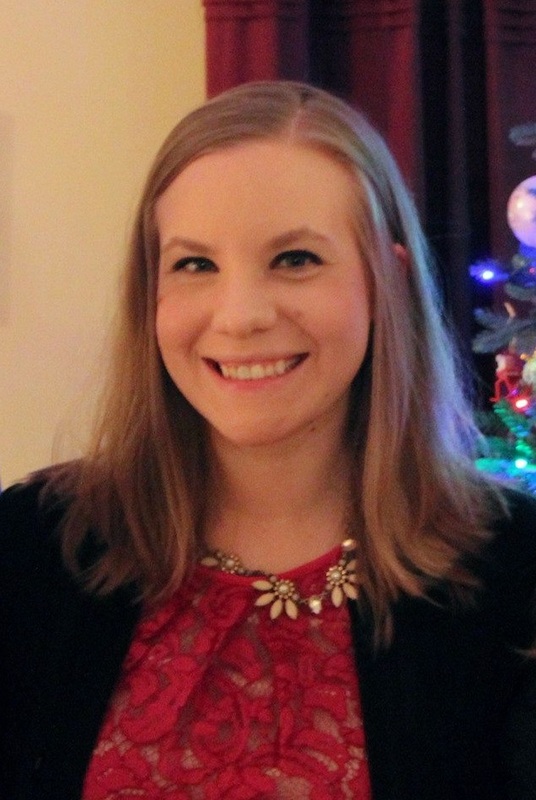 Sharing at Main Crush Monday! The last quilt I worked on was for Stephanie of Quilt 'n Party! Stephanie and I had been in the same hive in the Stash Bee at least once and she was also an Island Batik Ambassador last year. Her quilt is a nature and outdoor themed quilt. In consulting with her, we decided to balance out the already added blocks featuring flowers, butterflies, and trees with some classic quilt blocks. 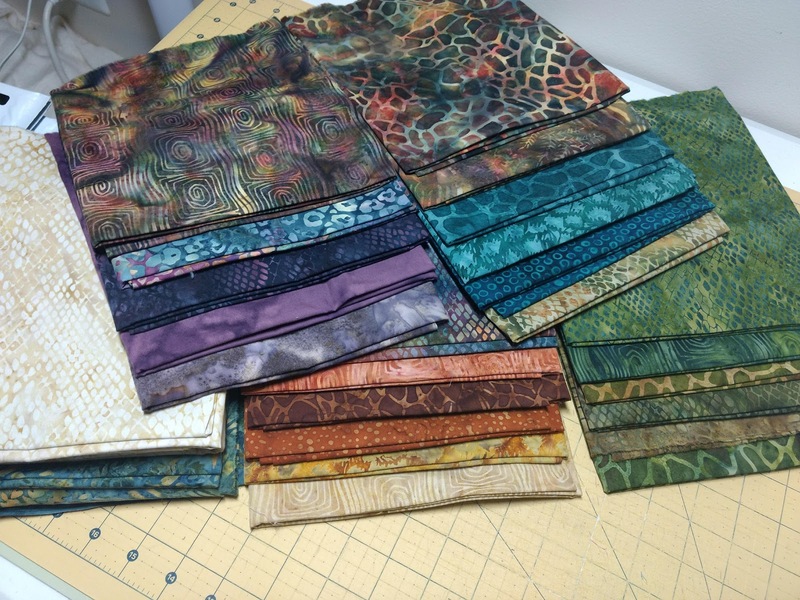 I pulled fabrics in the colors that are already featured in this quilt to make bear paw blocks and pinwheel blocks in various sizes. My row of bear paw blocks was added to the bottom and was 9.5" tall and my row of pinwheel blocks was added to the top and was 6.5" tall. Her quilt is now on its way back to Colorado for Stephanie to finish as she desires! From top to bottom the rows are from, respectively, Chelsea, Audrey, Karen, Karen, Stephanie and my original row at the bottom. I am still planning to stick to my original plan which was to sash these individual rows together with solid black fabric and then use the large scale floral print as the borders. I may or may not add a 4" block row or two, but it might actually be totally fine with just the rows that my bee mates have sent to me. I was hoping for a throw size with this one, and I think that has been accomplished! 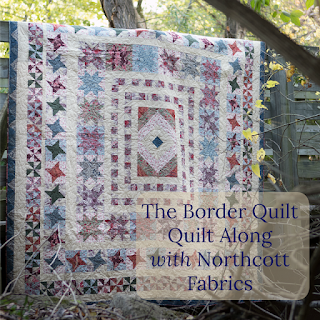 I'm excited to share that I am joining in on The Border Quilt QAL hosted by Patterns by Jen! Jen is a fellow Island Batik Ambassador and designs beautiful patterns, including this one! She was lovely enough to sponsor a giveaway as part of our Blocked Rainbow QAL this spring and I jumped at the chance to play along with her Border Quilt QAL, which starts in September! Click this link to see a full schedule for this QAL! 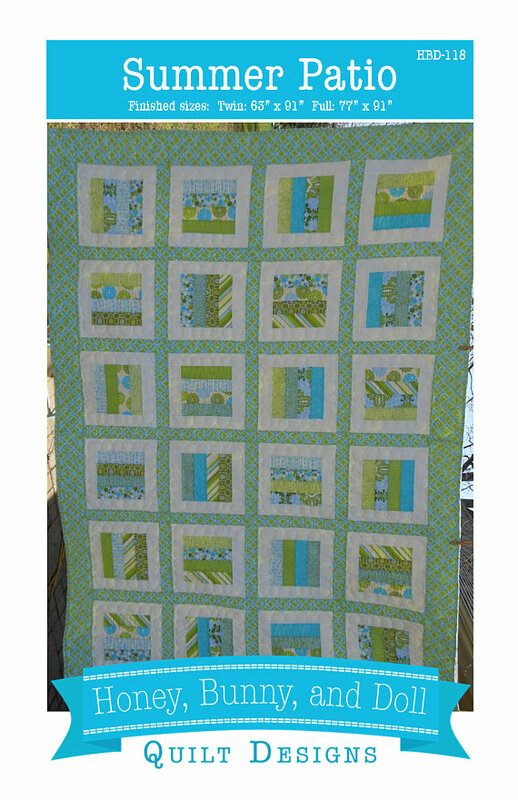 The fun part about this quilt pattern is that it is written so that you can make your quilt as small or as large as you'd like! 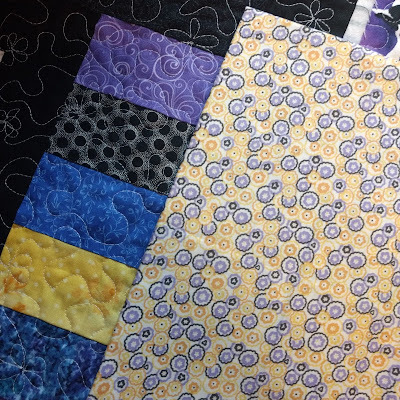 For me, I'm going to be making a scrappy version of the quilt. I pulled an older fat quarter (the paisley print) from my stash and pulled other fabric from my scrap bins to coordinate. My background fabric is Kona Champagne. 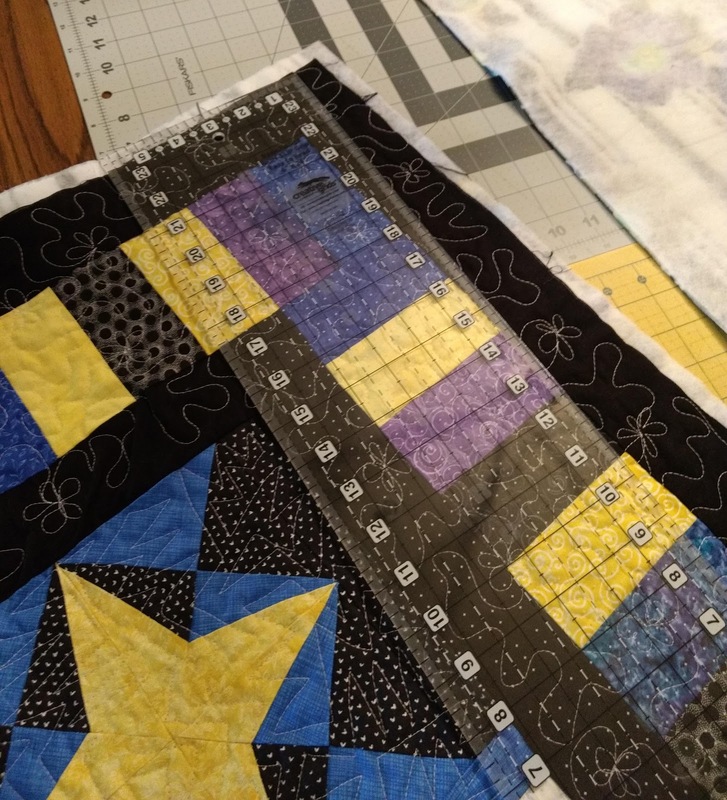 My plan is to make the quilt as big as my scraps allow, which I am estimating will carry me through the sawtooth stars. I'm also planning to do the pieced center. Looking at my current fabric pull, I might need to add in a few more dark pieces, but I'm sure if I dig deeper in my stash I'll find options. Additionally, Jen will be having interviews with some of us bloggers that are participating in the QAL throughout the month of August. Keep your eyes peeled for those! This little baby quilt was such a fun and fast finish! 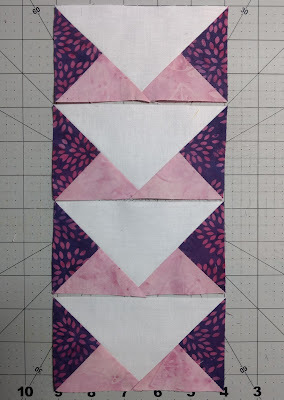 The pieced borders were added in a cinch! This quilt is 36.5" square prior to quilting, so I was able to use a single width of flannel for backing. I also pieced the batting together with a large zig-zag stitch. Waste not! Pressed, pinned, and ready to quilt! 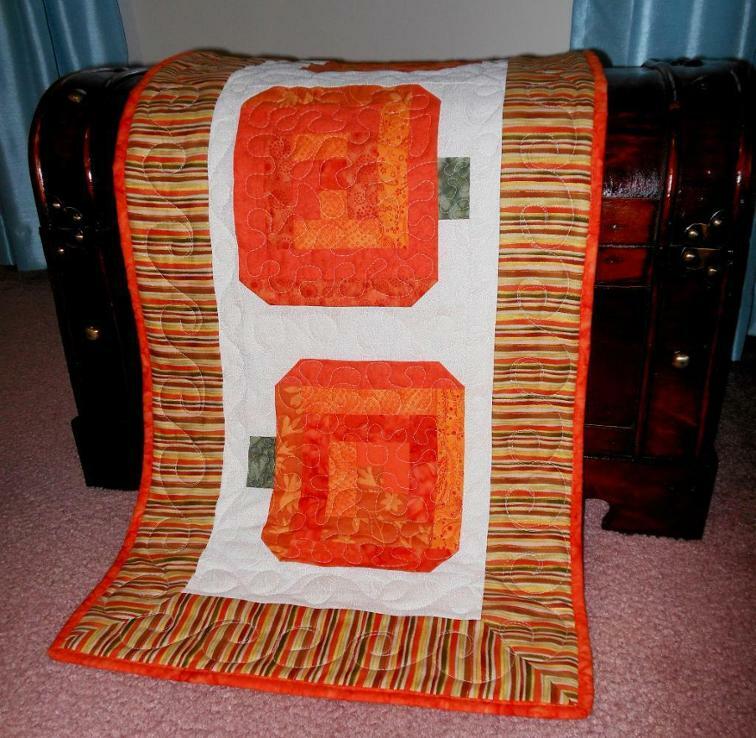 I quilted this with a leafy meander just like my Antietam baby quilt with white thread. I love quilting baby quilts -- I don't need a chair to support the rest of the quilt! 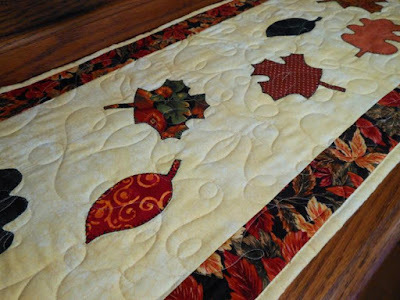 I love the way that the leaves pop with this quilting motif! 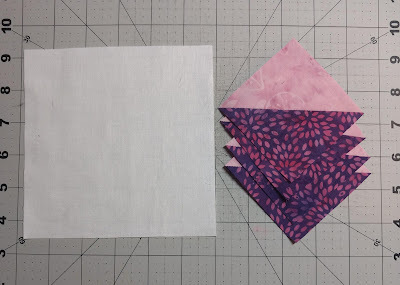 I used the purple binding that I had originally thought that I would use to bind my 30 Pearls quilt. It was the perfect length for this quilt -- I only had to trim the tails an inch and a half to join them at the end! I bound this completely by machine and used purple Aurifil which blended beautifully with the purple batik binding fabric! I learned with this quilt that yellow is hard to photograph. 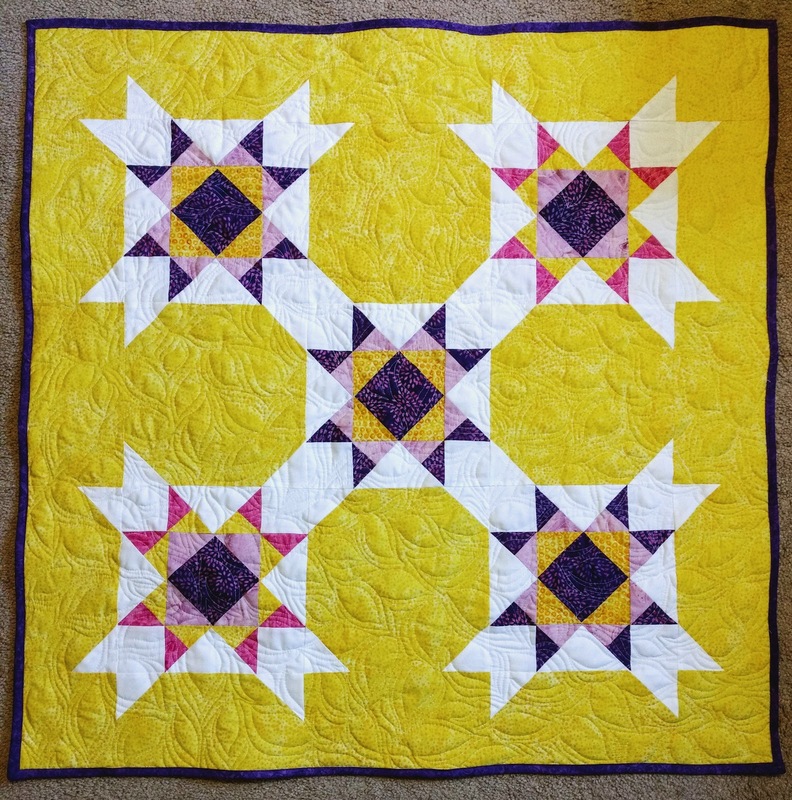 This quilt is a whole lotta yellow. I like the way that the white background fabric connects the stars. The star close up shows a great view of the quilting. The flannel that I used is a white and pink diagonal plaid. Now to get this quilt all ready to send off for baby snuggles! My July Island Batik Ambassador project is moving along nicely! Today I'm going to talk about the "fancy flying geese" used to make the Missouri Stars for this quilt. Most Missouri Star tutorials will have you individually piece the little triangles and the background for the "star point" sections of the blocks. 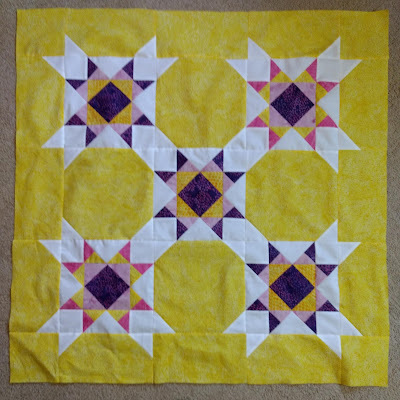 The method that I use combines half square triangles with the fast flying geese method to avoid tiny piecing and bias stretching. 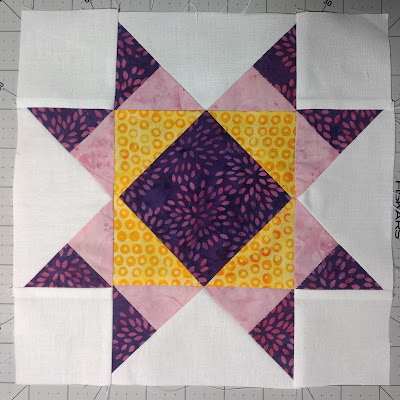 I originally came up with this idea when I wrote the tutorial for a 12" Missouri Star block for my Quilter's Choice QAL in 2014. 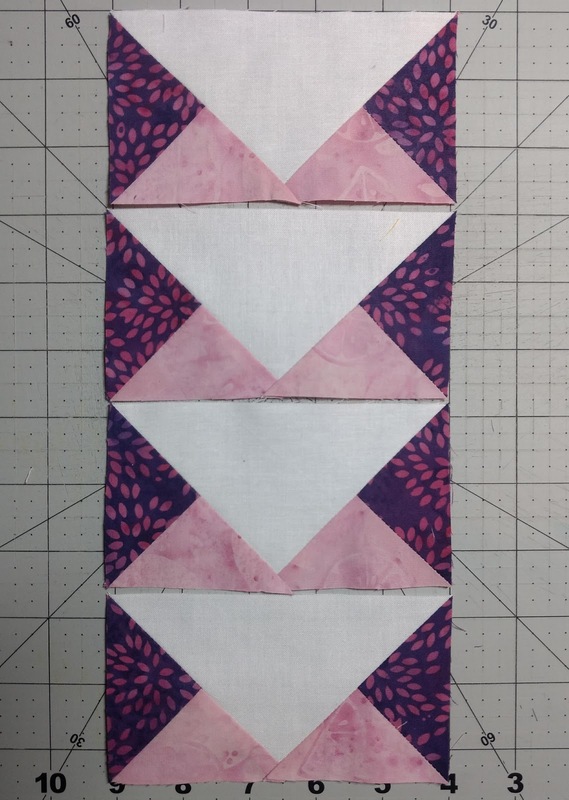 Replacing squares with pieced HSTs provides you a fun way to make your flying geese units more interesting. Since these blocks are 9" finished, my squares are scaled down from my original directions. 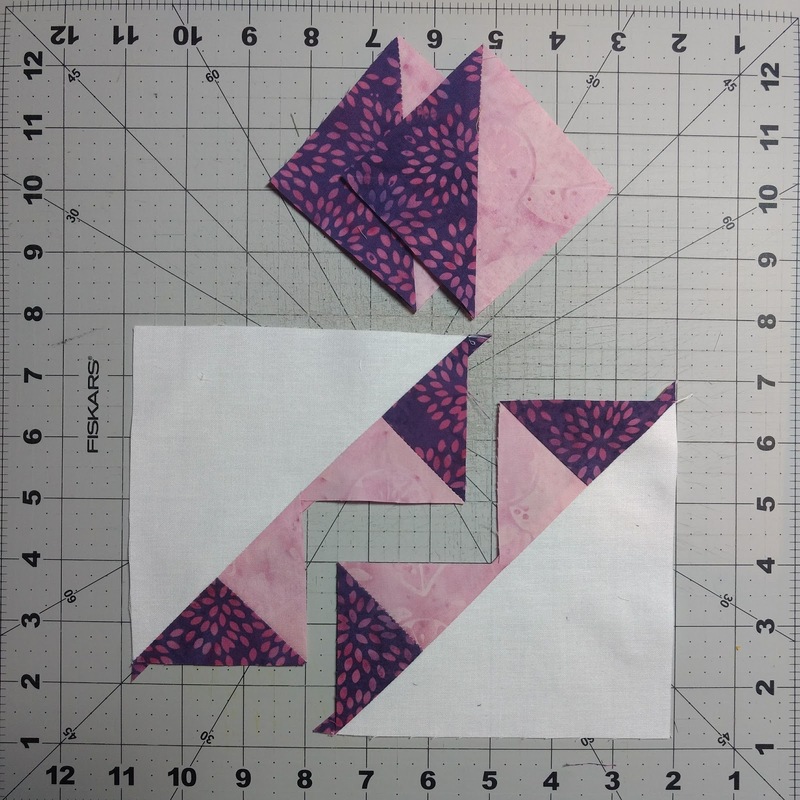 Combine your A and B focal fabric squares to make four (4) A/B half-square triangles. Draw diagonals on the back of your B squares, layer each right sides together with your A squares, stitch 1/4" from each side of the line, cut apart on the diagonal line, and press. Trim these units to 3 1/8". After trimming, draw diagonal lines on the back of each HST perpendicular to the seam. Layer two HSTs atop your background square with the same color of the HSTs at each corner and at the center. 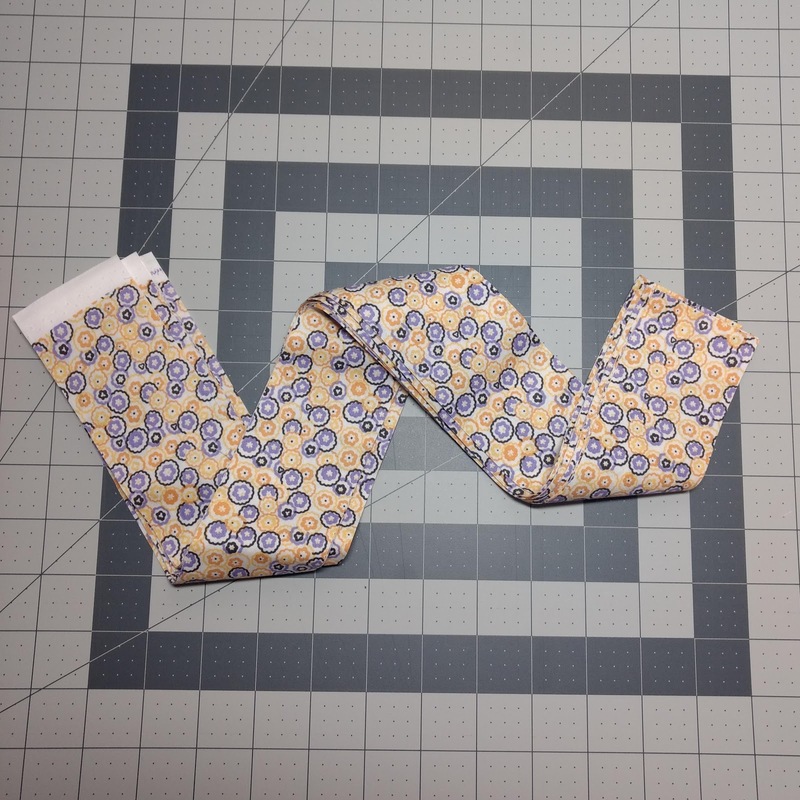 Sew 1/4" from each side of the drawn diagonal, cut apart on the diagonal line, and press toward your half-HSTs. Repeat with the remaining two HSTs atop your half-way-completed goose units. 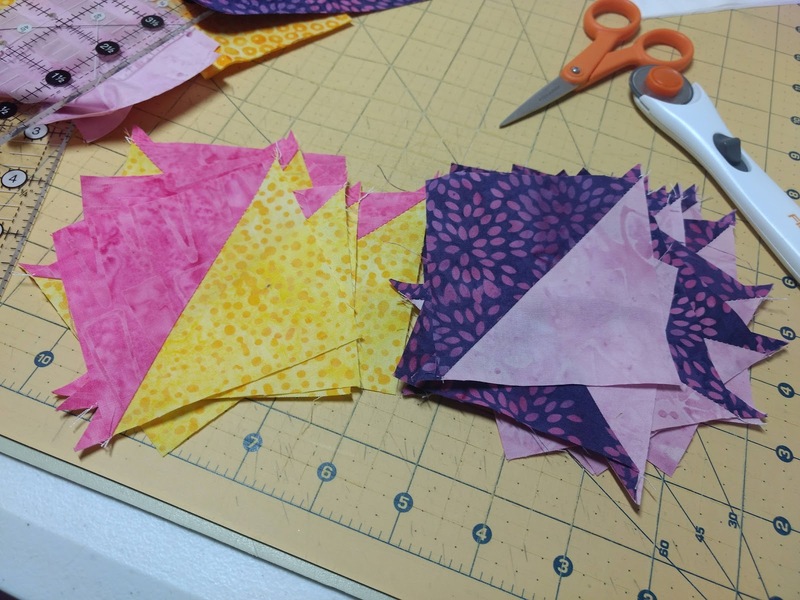 Cut apart on the diagonal line, and press toward the half-HSTs for four (4) complete Fancy Flying Geese units. 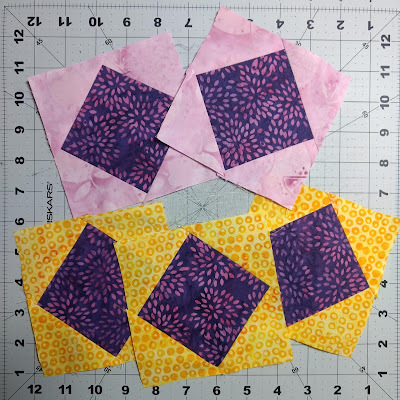 This method can be adapted for any size flying geese -- just cut the squares for your HSTs 1/2" or 5/8" larger than what would be needed for the fast flying geese method. And here's the center of my quilt all together! Now I need to work on the pieced borders and think about how to quilt this baby quilt! I'll need to grab some flannel for backing as well! As always a big thank you to Island Batik for allowing me to participate in their Ambassador program and providing me with these fun batiks to create with! In between working on my Island Batik challenge for July, I've been plugging away at my Drift Away quilt and have been able to finish the top! This project was supposed to be a leader and ender project, and I was having too much fun working on it to just leave it as a leader and ender project. The other complication (which I didn't necessarily anticipate) was that working on this quilt definitely required it to be laid out and planned out, which isn't very conducive to leader and ender projects most of the time. I also found that the big pieces of this quilt (the biggest size of squares is 8.5") took up a lot of valuable sewing station space! 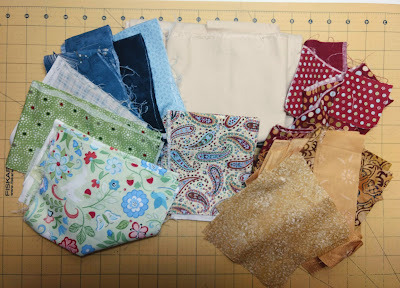 I think it's a miracle that I was able to obtain such a random and well blended layout of all of my different fabrics! As I noted in some of my previous posts about this quilt, there are some fabrics with great memories attached to them included in this quilt. Even if this is a quilt that doesn't live me forever, it's been a good change to work on a scrappy project with bigger piecing. I need over a yard of fabric for borders on this quilt so I haven't found anything in my stash. So at this point, I can either call it finished or start looking for a border fabric -- what do you think? Should I keep this 80 inches square or add borders so that it will be closer to 90 inches square? Happy Wednesday! 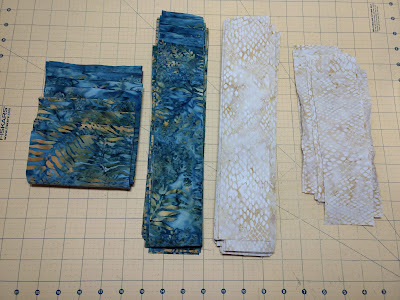 Sharing at Let's Bee Social, Needle and Thread Thursday and Oh Scrap! Don't forget to take advantage of our free shipping special in the HBD Etsy Shop!